We are renowned as the most popular enterprises in this industry, offering a high-quality Brass Inserts Nut that is used to connect the rubber hose to the cylinder or valve nozzles. These steel pipe flanges are tested in terms of quality by our quality experts for delivering a defect free range. Our professionals manufactured these brass inserts nuts by using the world-class material in adherence to an international standard. 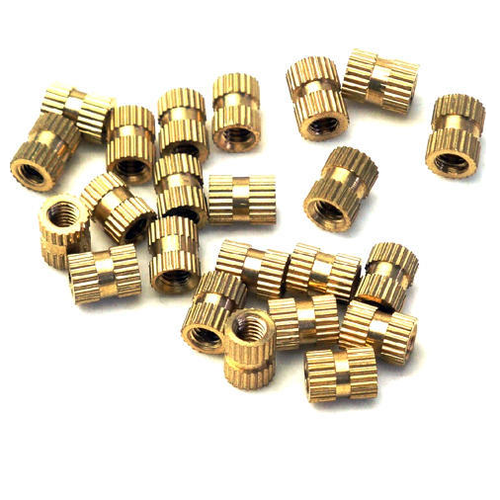 We offer these brass inserts nuts at nominal rates in a confined time frame. "Grand Metal Corporation" "An ISO 9001: 2015 Certified Company", Mumbai, was established in 2012, and are manufacturer, supplier, importer and exporter of a wide range of Industrial Ferrous and Non Ferrous Products like Valves, Industrial Flanges, Industrial Pipes, Industrial Fasteners. We also provide our clients Logistic, Third Party Inspection & Testing Services. Our valuable customers can avail different range of products such as Industrial Fasteners, Industrial Valves & Fittings, and Steel Products. These products are highly appreciated among our reputed clients for their rich attributes such as abrasion resistant, high tensile strength, and dimensional accuracy. Owing to high quality of offered products, we export our products to different parts of the world such as Middle East, African Countries, Bangladesh, Nepal, Malaysia, Singapore. We also import products from different parts of the world, some of the countries from where we import our products are Japan, Germany, China. Owing to our highly experience team of professionals, we have been able to offer high quality product range in stipulated time constraint. In order to operate all business operations smoothly, we have divided our professionals into various teams. Our team comprises of engineers, quality controllers, packaging & warehousing personnel, administrative staff, and skilled-semi-skilled workers. All team members work in close coordination with each other and also with the clients, to ensure high quality products. To ensure the optimum quality of offered products, our quality controllers test these on various parameters.